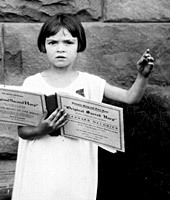 Six-year-old Lorraine Miles holds a songbook at a Sacred Harp singing in Mineral Wells, Texas, in 1931. She won a silver coin there for being the best child leader. That’s the unlikely term filmmaker Matt Hinton uses to describe Sacred Harp singing. He should know. He and his wife, Erica Hinton, spent years researching this early American tradition for their 2006 documentary Awake My Soul: The Story of the Sacred Harp. What is a “Sacred Harp”? Here’s a hint: It doesn’t have any strings. The Sacred Harp is the human voice, and Sacred Harp songbooks are meant for a capella hymn-singing. Born in the Puritan communities of the deep south in the 17th century, the tradition was developed to teach American Protestants how to sing. Unaccompanied by pianos or guitars, Sacred Harp singers of all ages sit in four sections, facing each other, usually in an old church where the hardwood floors will vibrate as the singers unleash hurricane-force harmonies. Caution: If you’re going to try this at home, warn the neighbors. Through the performance of “shape notes,” these all-day group sing-alongs roar at jet-engine intensity. “You’ll never find singers who sing harder than this,” says Hinton. Hymn-singing may not sound like the most riveting subject for a movie. But you’ll be hooked by the Hintons’ inspiring footage; Jim Lauderdale’s detailed narration; and the sheer magnificence of the human voice lifted in praise. “Christian art” is often dismissed as preachy, shoddy, disposable. But Sacred Harp shows that worship music can be a potent, profound human expression when it is manifested with passion and poetry. Already seen the movie (available at www.awakemysoul.com)? There’s more. The new double-disc soundtrack includes one disc full of Sacred Harp recordings and another on which those hymns are re-interpreted by artists such as Led Zeppelin’s John Paul Jones, Richard Buckner, Danielson, The Innocence Mission, Woven Hand, and Rick Moody (author of Garden State and The Ice Storm). Put it in your car stereo and give your subwoofers a taste of the Sacred. Then, visit fasola.org — as in “fa-so-la-ti-do” — to find the sing-along nearest you. Soon, you may find yourself packing a pair of earplugs and heading out to join the chorus.